The northern of the two crossings of the River Foyle, connecting most of the city to the rest of Northern Ireland, plus its approach roads. The elegant Foyle Bridge is without a doubt one of the most impressive feats of road engineering in Northern Ireland and is the longest bridge in Ireland. The city of Londonderry, or Derry, is the second largest in Northern Ireland with a population of 90,700 in 2001. The River Foyle splits the city, with about 75% of the population living on the "Cityside" (west bank) and the rest on the "Waterside" (east bank). The river is wide here and in order to access the rest of Northern Ireland those on the cityside had only the double-decker Craigavon Bridge close to the city centre. The Foyle Bridge which opened in 1984 was a much-needed relief crossing to the north of the city centre and by 2004 was carrying in excess of 30,000 vehicles per day. The bridge consists of a central cantilever span of 234 metres with several more approach spans giving a total bridge length of 866 metres. The portion over the water was built high enough to allow large ships to pass beneath. The girder work was built by Harland and Wolff shipyard in Belfast and transported to the site by barge. Total construction time was four years, from 1980 to 1984. The road itself was built to 2-lane dual-carriageway standard. The Crescent Link, which gives access to the eastern end of the bridge, was originally built as a 2-lane single-carriageway but this is currently being upgraded to 4 lanes. Due to the height and location of the bridge on the Foyle Estuary, the bridge is very exposed and windsocks were added shortly after completion to encourage drivers to take the high winds into account. The bridge is often closed during storms, although as this tragedy in January 2005 shows, not even this has been enough to prevent accidents (the Roads Service was absolved of blame). Nevertheless, traffic in the city would have been crippled had it not been for the Foyle Bridge and already there is talk of a third Foyle cross ing. 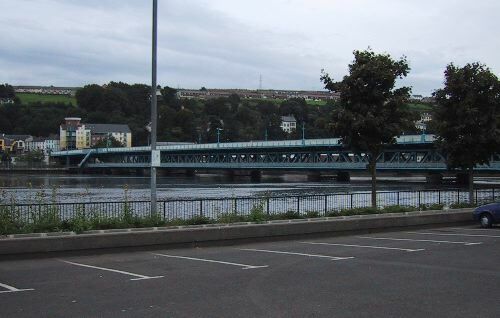 Another interesting piece of trivia is that the bridge crosses the Foyle at Madam's Bank, which is the same site as King James' army chose to place their boom barrier during the Siege of Derry in 1688-9. A major £10.6 million refurbishment project in 2003-05 saw the bridge strengthened to cater for 40 tonne HGVs, resurfaced and given a new lick of paint. See here. 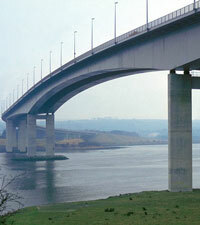 The Foyle Bridge seen from the western (city) end with its curved approach spans in the distance.